One of the most common questions we get about our lights is how many lumens they are. Lumens is a measure of light output for a light, but rating lumens is often confused with the true visible output of a light, especially when referring to LED lights. It is common for Internet shoppers to browse the Internet and simply look for the light bulb with the highest posted lumens for the lowest possible price. There is much more to consider than just the rated lumen. 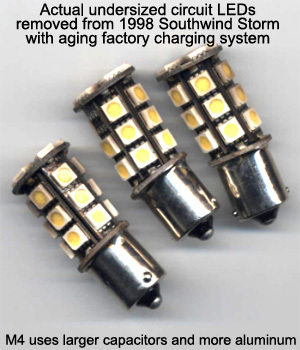 Quality LED retrofit light bulbs most commonly use what is called a SMD (Surface Mounted Diode) LED chip. You can identify the chip by it's size, yellow color and square profile. On SMD LED lights, lumens are simply calculated per chip. Larger 5050 SMD LED chips are rated at 15 lumens per chip. Our most common 5050 bulb uses 24 chips, so its calculated lumen output is 360 lumens (15 x 24 = 360 lumens). You can use this same calculation for any competitor’s bulb with 5050 SMD chips, 15 lumens x number of chips = total specified lumens. If they are quoting any higher lumens than the calculated amount, they are simply exaggerating their light output. Smaller 3528 SMD chips are rated at 5 lumens per chip, so our 30 chip bulb specification is 150 lumens, but please read on. As LED arrays use calculated lumens, comparison to lumen ratings of incandescent or halogen lights which have lab tested can be difficult. Visible light is a much better reference. As a rule of thumb, our Main 5050 chip products are designed to be of similar output to the original bulbs, and our 5630 chip products are designed to be brighter. We have also chosen the number of LED chips on our bulbs very carefully to balance the amount of light they produce, vs the amount of power they save. Many competitor 5050 LED light bulbs have only 18 chips which will indeed reduce the visual output compared to our 24 LED bulb. The most expensive component of an LED bulb is the chip itself, so by using only 18 chips they save money while often selling a light that cost substantially more than ours. You will notice our double aluminum plate light (see more information on this exclusive design below) only uses 16 LED chips. The reason we can use less LEDs on the plate light is that all of the chips are pointing in the direction where you need them when the plate is installed in a flat ceiling fixture. The visual light of the 16 chip plate is equal to the 24 chip bulb for this very reason, even though it is rated at 240 lumens. Respectively, it also uses 33% less power. Primarily, when shopping for LED lights for your RV, you really need to consider the quality of the components that hold the LED SMD chip. All chips are pretty equal in quality and output, but it is the way the cage and plates are designed and made that differentiate the overall quality of the finished product. If you were to find a competitor's 24 5050 SMD LED bulb and compare the light output to our 24 5050 SMD LED bulb, the light output will be the same. There are many LED light bulbs that are being sold that were never designed for continual use like in an RV (many even being sold at RV related websites). Those bulbs are designed for car taillights, or are simply thrown together cheaply since they do not understand the RV market as well as M4 does. RVs demand more from electronic components. From battery chargers, to shore power, to discharged batteries and battery regulation, RVs demand the most from products like LED lights. 5050 SMD based LED lights still create an amount of heat, especially in an enclosed fixture. This heat output is substantially less than an incandescent light bulb, but it is still a significant amount of heat that will affect the life of the SMD chip. All of our light bulbs are designed specifically for RV use. Most are rated at 10-30 Volts. 10-30v lights work in a normal 12v environment, but they include circuitry within the bulb to make them handle voltage surges very common in Recreational vehicles. Next, all of our 10-30 Volt bulbs are non-polarity. Since LED lights are diodes, every SMD chip has a positive and negative, and they will not illuminate and can be damaged if the polarity is reversed. Our circuitry prevents any reverse polarity damage, and makes it so the bulb illuminates regardless of the wiring of the light fixture (many RV light fixtures are wired backwards from the factory which is not an issue with incandescent bulbs as they will light either way). 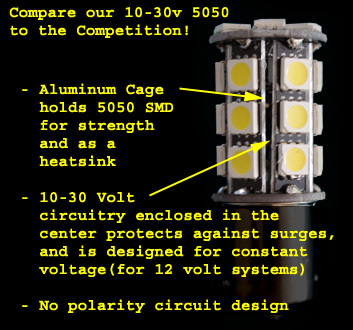 Finally, all of our 10-30 volt bulbs with 5050 chips have aluminum cages where competitive cages are made solely from fiberboard. This aluminum serves two purposes, 1. to function as a heat sink to extend the life of the LED, and 2. so they don’t break down over time like a fiber board. You can feel the weight difference from our bulbs to competitor’s bulbs and see the difference in the image above. Our Elite Series bulbs not only have the same circuity, but they use brighter Samsung 5630 LEDs, and even more aluminum in their bodies. M4 is continually improving our products and encourages your feedback. We learn from your infinite number of RV and Trailer variations and configurations. Our exclusive double aluminum plate with 16 SMD chips has several design features which make them the best light in the market. First, the aluminum board works as a heat sink. Second, since the board that works as a heat sink is not the same as the board which is affixed to the light fixture, the included super sticky foam adhesive tape is not prone to heat damage and failure. 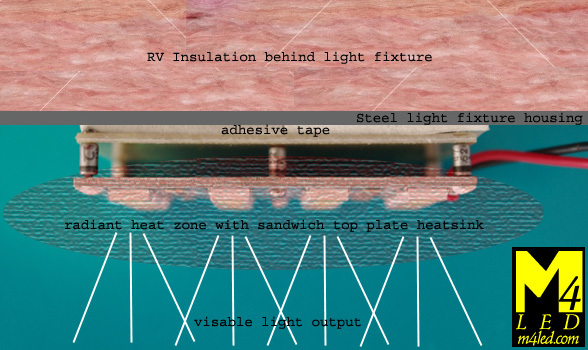 Additionally, the heat generated by the board does not get transferred to the light fixture housing (which was never designed to be a heat sink) and into any components such as insulation and wiring which are behind the fixture. If you take the time to compare any of the lights M4 sells to competitors products, you will find that our lights not only offer the best price when you compare them feature to feature, but we have done the research to provide a quality product with consideration to specific demands of the RV light application.